Ok, so I was browsing along today and stumbled upon Michael Moore’s message to America, “One Day Left“, an article in which he strongly endorses Kerry and strongly slams Nader. 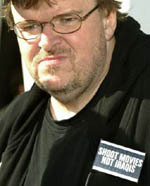 Now, you may have seen my post a little bit ago, “Moore Apathy“, in which I explained why I didn’t like his approach to Fahrenheit 9/11 even though overall it was a good movie. Well, after reading his recent article, I can now say I believe that Moore has officially tossed all political logic out the window and has turned to the dark side. He may still be a good person, but I honestly don’t believe that he should be giving political advice anymore. Does he care what I think? Who knows, but I sent him an e-mail anyway. "Moore Silence" by Jeremy Felt, unless otherwise expressly stated, is licensed under a CC BY-SA 4.0 International License.